Sequestration: House Republicans downplay effects of spending cuts. 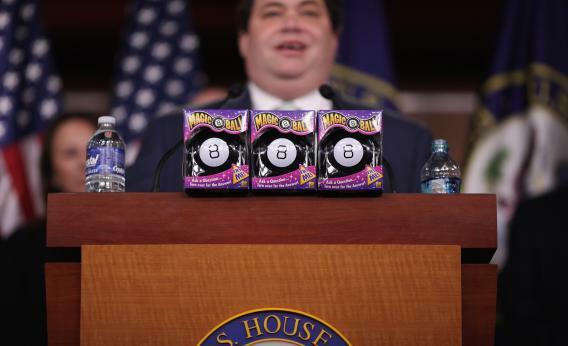 Rep. Blake Farenthold (R-TX) stands behind three toy Magic 8 Balls lined up on the podium to note the 888 days since the Senate has passed a budget during a news conference at the U.S. Capitol on October 4, 2011 in Washington, DC. A news station in Indiana reports on a “$30 million construction project” stalled by sequestration. The Winston-Salem Journal reports on an FAA tower’s closure. The Cincinatti Enquirer goes long on the industries that fear the ax. These are among the fifty-odd stories Democrats have pinged me about to highlight how sequestration is actually playing at home. The party has a mounting problem: In Washington, sequestration is covered as alternately 1) not a big deal or 2) a non-big deal that the president is fibbing about. The Washington Post’s Fact Checker column has made casserole out of White House claims about fired janitors (four Pinnochios!) and canceled vaccinations (two Pinnochios!). By now, you might have expected some Republicans to fret about sequestration hurting their districts. Nope! The argument these days is that the White House is bluffing and won’t give flexibility to agencies to move money around—an idea that required a new bill, one that didn’t pass the Senate.